Maximum Valve Lift (in): 0.580 in. All Speedmaster 23deg. Small Block Chevy heads are available with Straight or Angled sparkplugs. Standard valve sizes are 2.020" Intake, and 1.60" Exhaust, both +.100" length. While the 2.02" valves are standard issue, all of our 23deg. aluminum heads can accept a 2.05" intake valve with minimal additional work. 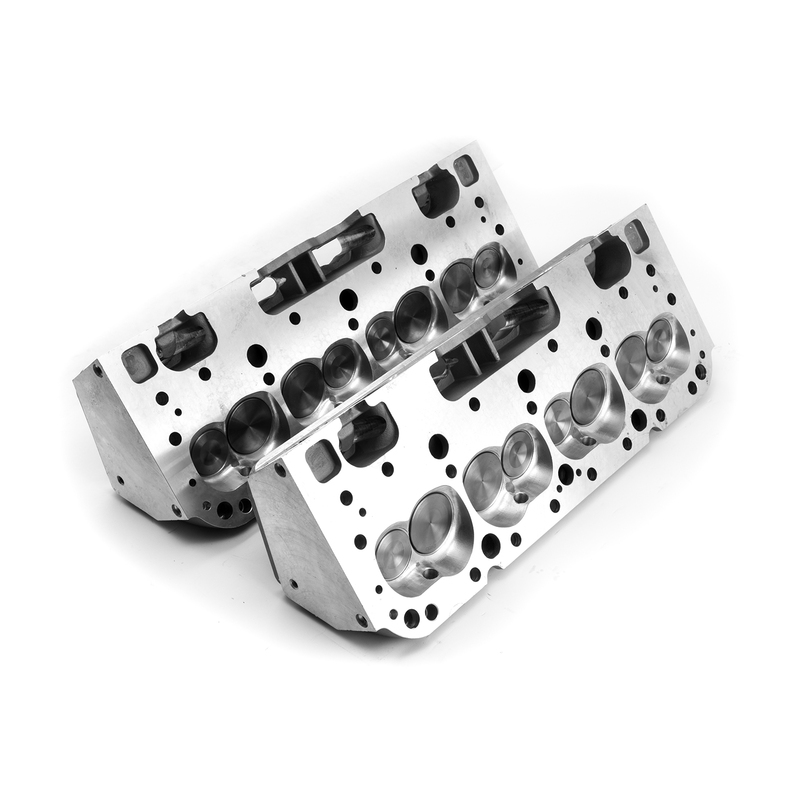 Some of our CNC ported heads (PCE281.1354-1448) are designed around 2.05" Intake valves. Our cast iron heads use 1.94" intake valves, and 1.50" exhaust valves. For those racers looking for a head with 800+hp potential, step up to our new 15deg heads! These heads have room for huge 2.180"-2.200" intake valves. We even have the matching rockers! 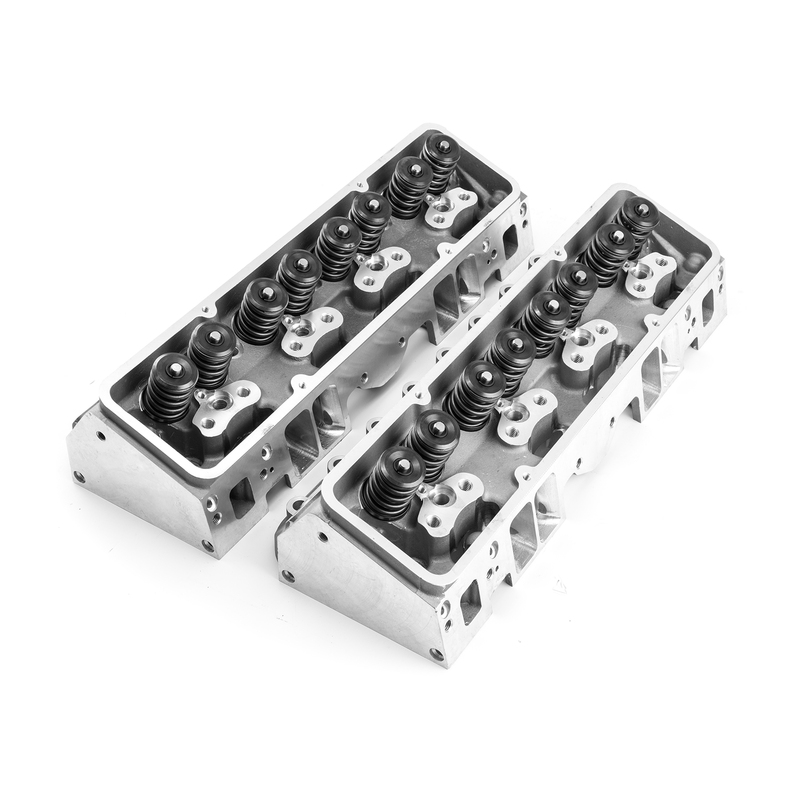 Speedmaster CNC ported cylinder heads are machined on dedicated 4-axis and 5-axis CNC machining centers to ensure accuracy and cost effectiveness. Combustion Chamber, Exhaust and Intake Ports all fully CNC machined for better flow. CNC combustion chambers offer superior control over flame travel and quench area. 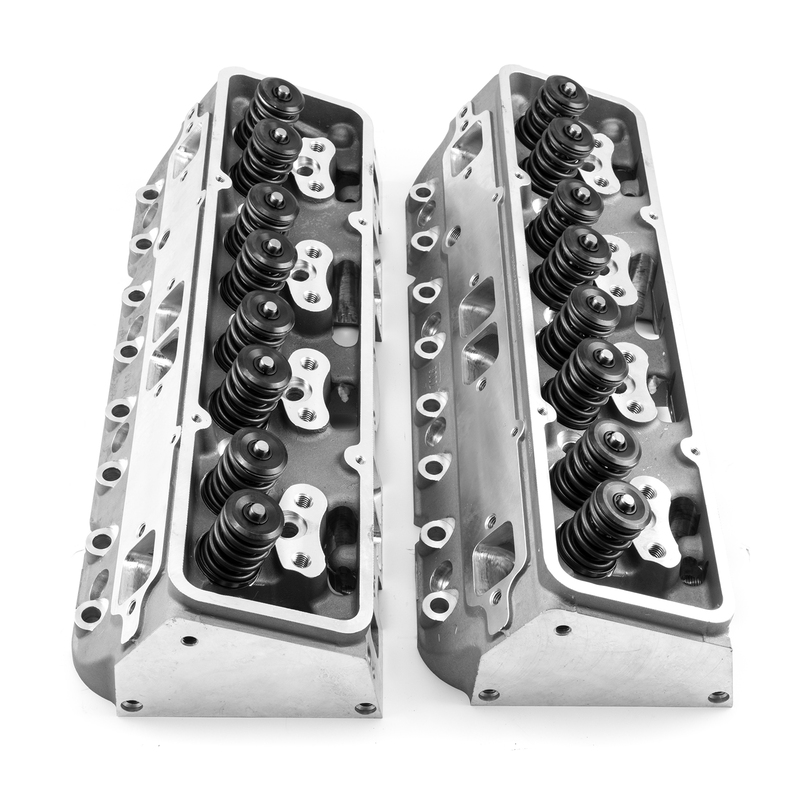 CNC Ported heads eliminate human error and variation from port to port. Unsurpassed repeatability from one cylinder head to another that is commonly found in "Hand porting & Polishing"
Combustion chambers are exact in volume - so every cylinder has the same compression ratio. Each port is the same cross section - so every cylinder can reach higher true RPM potential. CNC machining produces ports and chambers to within tolerances of no more than .002"; in turn every cylinder can reach the same power potential and accurate tuning. The head gasket we recommend for our 23deg. heads used on 327/350/383/400 SBC engines without steam holes is Felpro #1003. On engines using the GM 400 block, or aftermarket blocks with steam holes, use Speedmaster PCE348.1006 or Felpro #1014. 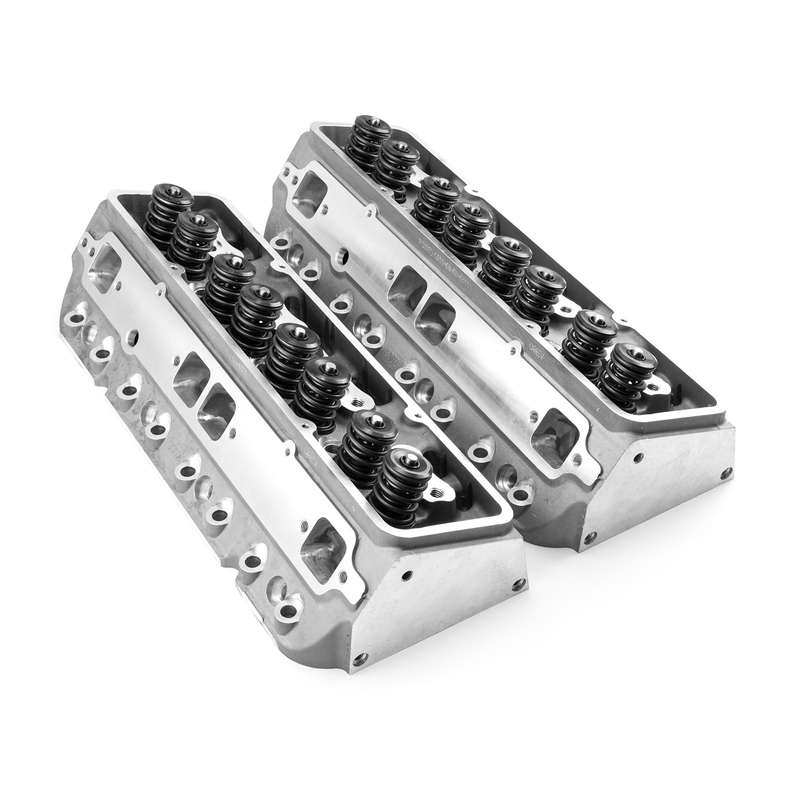 Our heads are manufactured with both the conventional intake manifold bolt pattern, and the Vortec bolt pattern. If you're installing a Vortec manifold, use Felpro #1255 gaskets. If you are using a convential intake manifold, use Speedmaster PCE349.1002 or Felpro #1266 gaskets. Our aluminum 23deg. heads typically use +.100" (longer than stock) pushrods, Depending on the components used, it is possible that you may need pushrods shorter or longer than that so we recommend that you use an adjustable pushrod to dial in your rocker geometry and order pushrods to match. All Speedmaster 23deg. SBC heads use standard 14mm. x 750" reach, 5/8 hex, gasket seat sparkplugs like NGK R5671A-7, Autolite 3924, Champion RC12YC, etc. Remember that higher compression/ boost require a colder heat range sparkplug. Our 23 degree heads utilize standard head bolts or studs. Our part number for head bolts is PCE279.1002, and the head studs are PCE279.1001. For the 15 degree heads, we recommend SM2451-15DEG. headstud kit with 3/8" reduced shank on the studs between intake ports. The ARP head bolt part number is 134-3601, and ARP head studs 234-4301 for the 23 degree heads. ARP also makes a head stud kit that is compatible with our 15deg. heads on cast iron blocks with part number 234-4723. We recomend the use of our Exhaust gaskets # SM5120 or Fel-Pro #1405 on our 23 degree heads. On our 15 degree heads, use SM5121 or Fel-Pro #1409.